Assessments are gradable, question-based activities that use questions you create and/or link from question banks. Each question can be aligned with specific objectives in the course, and student performance on objectives can be used to make formative or remediation assessments. Students are required to complete assessments according to conditions set by the course author and submit all answers at once. Assessments are automatically graded and can be password protected. For a condensed view of some standard assessment settings and tools you may want to use: What assessment tools can I enable for my students? Add this activity to your course. Use the Filter by group icon to make and/or review activity settings that apply only to specific groups. 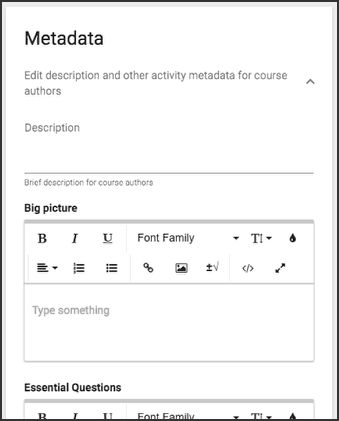 Use the Activity screen to add/edit basic content that, information, and metadata about an activity that is visible/accessible to the students (e.g., activity titles, thumbnail images, introductory content, instructions, attachments students need to complete the activity). Use the Settings screen to configure the way you want the activity to work for the students (e.g., gradebook settings, objective mastery and badge details, visibility, access). 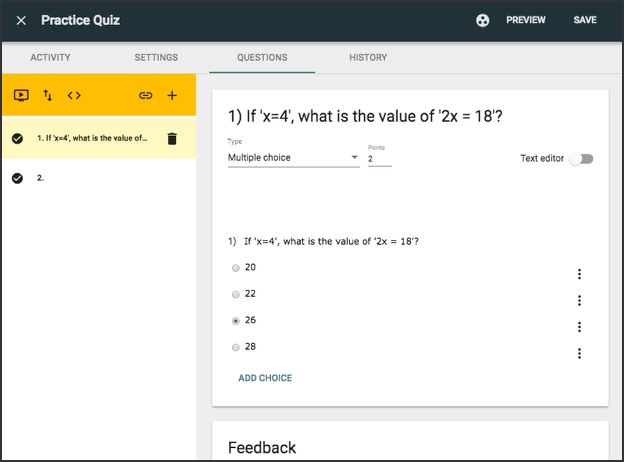 The Questions screen only appears for Assessment and Practice Question (formerly Homework) activity types. Use it to create and manage questions. The History screen only appears when changes have been made to an activity since its creation. Use it to review changes and restore previous versions of the activity's content. Some cards in the Activity Editors are collapsed by default; to expand them, click the arrows. Provide a Thumbnail image to represent the activity by clicking the plus sign next to the thumbnail. Create descriptive Content about the activity using the rich text editor. This content always appears at the top of the assessment. Click Add Activity Instructions to open a rich text editor to create instructions. Students can access this content by clicking a pencil icon at the top of the assessment. Click Add attachment to provide files for students to review before starting the assessment. Make a Basic, Standard, and/or Scientific calculator available to students while they complete the assessment. Click Add under Companion Material to add resources that students can reference while they're taking the assessment. You can only use PDF files here, but no worries: you can easily convert documents and images to pdfs using both PCs and Macs (this is called "printing to pdf"). The Due date and time. Whether you want to Allow late submissions, and, if so, what the Late rule and Grace period rules are. The allowed Number of attempts a student can complete for that assessment. The total Questions per page you want your students to see. Allow save and continue for the assessment. Meaning students can start an assessment, save it, and return to it later. Without activating this option, students must finish and submit an assessment once they've started it. Require answers for submission. Meaning students are only allowed to submit the assessment after answering all of the questions. If not enabled, students are notified that they haven't answered all questions when trying to submit an incomplete assessment, but can still submit. If you choose Rubric, click Add rubric to define it (not available for all assessments). If you choose Letter grade, a field appears where you can select the desired Grade scale. The Grading category you want the activity to be a part of. 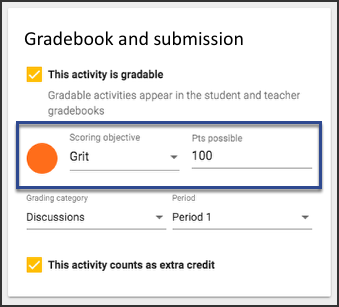 Grading Categories allow you to apply different grade settings to groups of activities within the same course. The grading Period you want the activity to be a part of. Separate grading Periods allow you to divide grades by date range without building additional courses in Buzz. Whether you want the activity to be considered Extra credit. 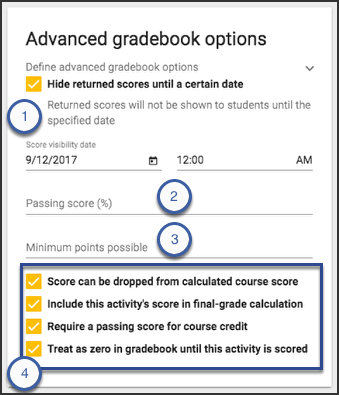 In Multi-Outcome Scoring courses, Gradebook and submission allows you to align activities with Scoring objectives and requires you to use Points as the Score entry. Auto-graded activities, like assessments and practice questions, can only be aligned with one scoring objective, so you must choose it from a dropdown menu and then assign the desired number of Pts possible for that objective. Click Choose Badge to select one or more badges that you want automatically awarded to students who successfully complete this activity. Click Choose Objective to align the activity with one or more objectives. An activity Description for course authors. An idea of how this activity fits into the goal of the course or the Big Picture. Essential Questions that should be answered by the activity or that students should keep in mind as they complete it. Some of the fields under Metadata ask for content that, if set up by your system admin, can be used to make an activity searchable in the Digital Library. Contact your system admin to find out if there are fields in your domain that can be used this way. Students, teachers and observers: This is the default setting for activities intended for students to complete. Teachers and observers: This setting works well for Lesson Guide materials that observers like parents, mentors, etc. need access to. A map icon appears next to these activities in the Activities pages for teachers and observers. Teachers only: This setting works well for Lesson Guide materials that only teachers need. A map icon appears next to these activities in the teacher Activities page. Check the Hide from student's table of contents and to-do list box. Note that it is still accessible with course links and bookmarks unless otherwise restricted. 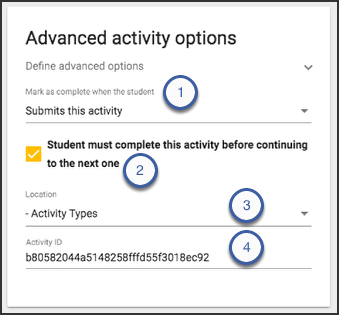 Check the Block access until student completes other activity box, click Choose Activity, and select the activity or activities that you want to make access dependent on. 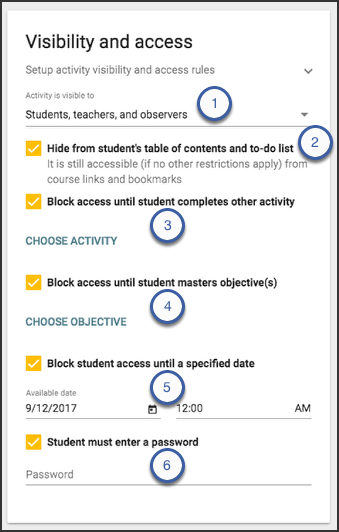 Check the Block access until student masters objective(s) box, click Choose Objective, and select the objective(s) you want to make access dependent on. Check the Block access until a specified date box and enter the desired date and time. Check the Student must enter a password box and enter the desired Password. Students must enter this password only once to access the activity. This is different from assessment-specific passwords, which must be entered each time a student attempts the assessment and are managed in the Advanced assessment options card. An assessment pool is a collection of questions. 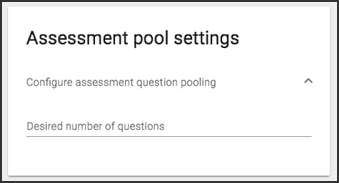 You can set up Buzz to randomly draw a certain number of questions from a pool and use them to create an assessment. Setting a Time limit in minutes. Specifying a Default question score. You can assign each question a specific point value; if you don't, Buzz uses this default value. Specifying an Attempt minimum for the assessment (the minimum number of attempts you want the student to complete). Start assessment automatically upon selecting it, or if you want to give users a Start button. Show highlighter, which allows students to highlight text while taking the assessment. To provide the highlighting tool for an essay question, make sure to put the essay question on its own page. To provide the highlighting tool for a passage question with multiple questions attached to the passage, make sure to display the attached questions on the same page. 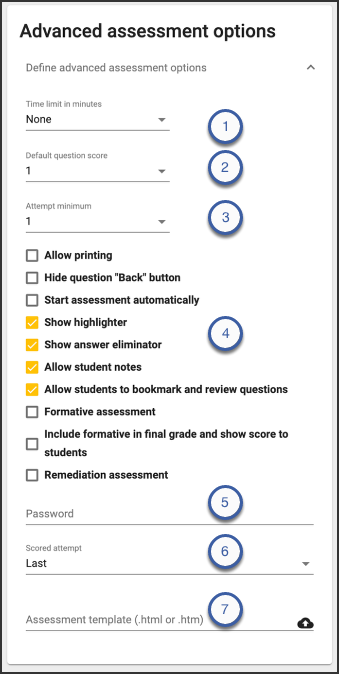 Show answer eliminator, which allows students to eliminate multiple choice questions that they think are wrong while taking the assessment. Allow student notes, which allows students to record notes about a question while taking the assessment. Allow students to bookmark and review questions, which allows students to review questions while taking the assessment and filter by those they have answered, those they haven't, and those for which they've recorded notes. Make it a Formative assessment and, if so, indicate whether you want to Include formative in final grade and show score to students. Make it a Remediation assessment. Providing a Password if you want to require students to enter one every time they start, continue, or retake the assessment. This is normally used in proctored assessments where a teacher or aid can give the password directly to students. This is different from a general activity password that students only have to enter the first time they open the activity. Indicating which Scored attempt you want recorded (Last, First, Highest, or Average). Uploading or selecting an Assessment template. Whether you want to Hide returned scores until a certain date, and, if so, providing the Score visibility date and time. Defining the minimum Passing score (%). Settings the Minimum points possible. The assessment's Score can be dropped from calculated course score (unavailable if the activity is marked as Extra Credit in Gradebook and submission). To Include this activity's score in the final grade calculation. To Require a passing score for course credit. 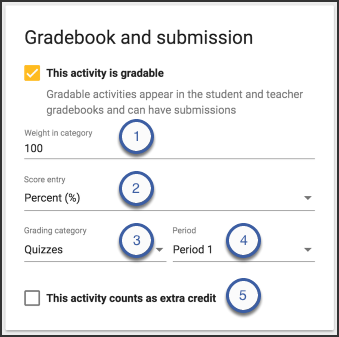 To Treat as zero in gradebook until this activity is scored (unavailable if the activity is marked as Extra Credit in Gradebook and submission). If the Student must complete this activity before continuing to the next one. Changing the activity's folder Location using the dropdown. Giving the activity a new Activity ID in the field. Use the Questions tab to create, edit, and manage assessment questions. Click the version you want to restore. Buzz does not itemize changes to all settings, but does track them. Users can access them by clicking the Details link that appears at the bottom of the history table. How do the "Advanced - Time Limit" and the "Assessment - Allow save and continue" settings work together. Can a student begin an assessment and have the timer continue until they close the assessment, then come back to it and have the timer continue to run? Further, what are the relationships of the following time information to the Activity Time Limit setting? - On the Score/Activity History tab, the system shows a "Total Time" field. 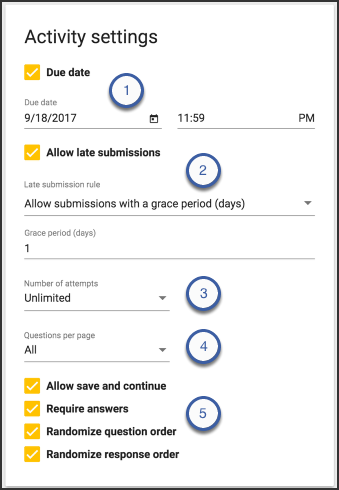 If "Assessment - Allow save and continue" and "Advanced - Time Limit" are enabled together when the student returns to a saved attempt the timer will have the same time remaining as when they saved. So if a student saved and exited the attempt with three minutes left on the timer they will still only have three minutes when they continue. The assessment time limit will only affect the amount of time the student has after clicking the "Start" button before the assessment will auto-submit. The total time for the overall activity includes the student reviewing the landing page and so the overall activity on a quiz can and likely will be more than the time limit. 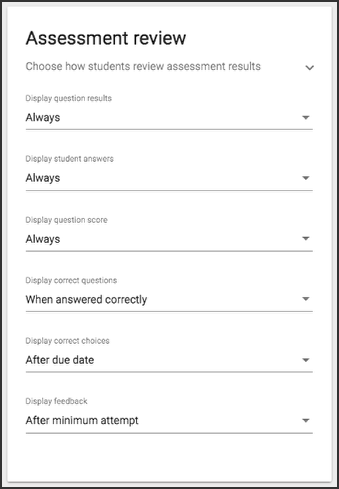 This is due to activity being tracked when a student selects the item to review the score, instructions for the item, and when the assessment is actually being taken. Thanks Scott. I presume that the "Advanced - Time Limit" is intended to limit the amount of time that the student can spend actually taking the assessment and time spent reviewing the landing page, etc is not counted as time spent taking the exam per the time limit specified? If so, is there a reliable field or place to look in the UI to get the actual time spent taking the actual assessment? We are getting reports of students who claim the assessment submits before the time limit is reached, but the time listed on the Score/Activity History shows more time than the time limit that is set. So, I would like to confirm how much time is actually being spent that counts against the Time Limit setting. You are correct that the time limit only affects the time actually taking the assessment. It doesn't take into account the time spent viewing the item before "Start" is selected or after "Save and exit" or "Submit" is pressed. In the UI just under the "Submitted" time stamp line in the Grade Editor is a line for "Active time" which will show how long the student was actually taking the assessment. This is our scenario. An assessment has 1 limit with "Allow Save and Continue" OFF. A student starts an assessment, internet goes off. The student closes browser. Internet is fixed. The student logs back in again. The assessment is continuing from where the student left off instead of restarting. Is this expected behavior? In the situation where the internet connection is lost there isn't an opportunity for Buzz to send a request to submit the attempt as there is no ability to send any commands so the last stored data is held in stasis for the user to be able to return and submit. This behavior is expected, note this will not allow students to have more time if it is a timed assessment. How do I use the assessment/practice questions Text editor? How do I use assessment variables?